In the Bridge Program we offer general education and free electives. 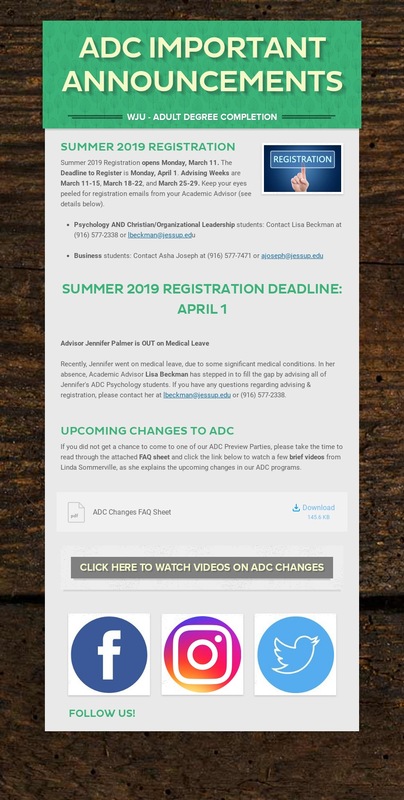 Students who are working to meet the entrance requirements for their chosen major, or are seeking to complete requirements for graduation are encouraged to enroll in the ADC Bridge program. Bridge classes are five or seven weeks in length and scheduled in a manner consistent with Major courses, allowing students to complete all their degree requirements at WJU in a time effective and continuous manner. Please click on the link below to view the most current ADC Bridge Schedule. If you have any questions or would like to register for a course, please contact Jennifer Palmer, your Academic Advisor at jpalmer@jessup.edu or (916) 577-2336. NEED TO REGISTER FOR COURSES? ALL REGISTRATION FORMS HAVE BEEN RELOCATED TO THE REGISTRAR’S PAGE LOCATED HERE.